Okay, so the room was too small (as is becoming the case regularly at Vancouver Skeptics in the Pub); and we had some audio-visual issues; and we practically abandoned the Skype connection after the initial video-call to Edmonton; the Edmonton co-host got sick and didn't show up; the Edmonton host had to leave after the first round - leaving a newly appointed co-host to finish up; and we had enough people show up late in Vancouver to make up an entire new team... but I think that it was a wild success on our end. I am talking about the Western Canadian Skeptical Smackdown which was held last night in Edmonton and Vancouver. 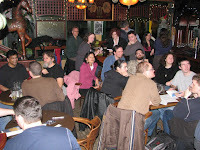 Desiree Schell of Skeptically Speaking was the Edmonton host, and I was the quiz-master in Vancouver. If anyone wants me to send them the questions so that they can run their own quiz - by all means! I'll even tweak the language on the debatable question, so that there is no debate. Fair warning... while there are some questions that should be easy for any skeptical/scientific crowd & every question was answered correctly by someone... there are some really tough questions. 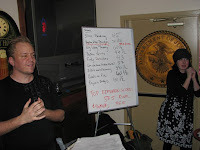 Even the top scoring team only barely cracked 75% and roughly one third of the teams didn't get more than 50%. (Indeed, one answer sheet - from a team that placed in the top 5! - came back at the end of the night with the message "WTF guys?!? This is Hard. SRSLY!" And so it should have been - everyone had to work for every point. There were three different cross-provincial challenges going on, as well as one in each city. - The top scoring team. - The highest overall team score out of both cities. - Each city's Skeptical Radio show (Skeptically Speaking and Radio Free Thinkers) challenged each other. - Desiree and I each chose a "Champion" to represent us before we started. As my Champion Team I chose the team that named itself "Big Wang Theory" - it was a pretty terrifying looking team from the outset, comprised of: Paul Ingraham - Skeptical (ex) Massage Therapist; Rob Tarzwell - An increasingly well known doctor and skeptic in Canada; Robert Light - whose research as a playwright into the life of Charles Darwin is truly staggering; and Fred Bremmer... who just might be skepticism's ultimate fanboy (and whose photos adorn this post). Due to the quality of our video Skype connection I didn't clearly get what Des's Champion team was, but I shall update here as soon as I can confirm it with her. She did point to the literal "Far Table"... so I am going to assume that the team she picked was the one named "The Far Table" in Edmonton's results. At the end of the first round, Big Wang Theory was ahead of all teams. 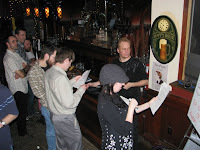 By the end of the second round (a misleading name as there was a paper-round between the two rounds) an Edmonton team had pulled into the lead by 1 and 1/2 points. 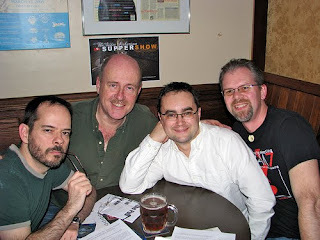 Going into round three, (by which point Edmonton had got well ahead of Vancouver as we were slowed by the added logistics of having 9 teams crowded into too small a space) Radio Free Thinkers had to get a minimum of 6 and 1/2 points to beat the Skeptically Speaking team. I am looking forward to the Big Wang Theory coming back to defending it's title next year... when there will hopefully be more teams from Edmonton as well as teams East of the 100th meridian involved too. Then we can drop the "Western" qualifier from the Quiz's title. Rob and Fred on one team? Yeah, they stacked their own odds. But it sure will make for epic battles as people try to take the crown from them in future contests... kinda like other countries trying to beat Canada at curling. Heh. 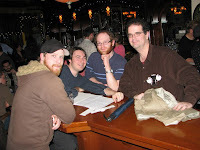 You can credit Paul with inviting Rob T. and me to be on his team, and both Rob T. and I (independently) wished for Rob L. (winner of November's Skeptics in the Pub Origin of Species anniversary evolution/Darwin trivia contest) to be the fourth member of our team. It was fate. No, wait... it was written in the stars. No, wait... our fate "lies not in our stars but in ourselves." Whatever, it was a lot of fun.